The HKUST MBA Alumni Toastmasters Club had a Demo Meeting for people who wanted to try their hand at public speaking. 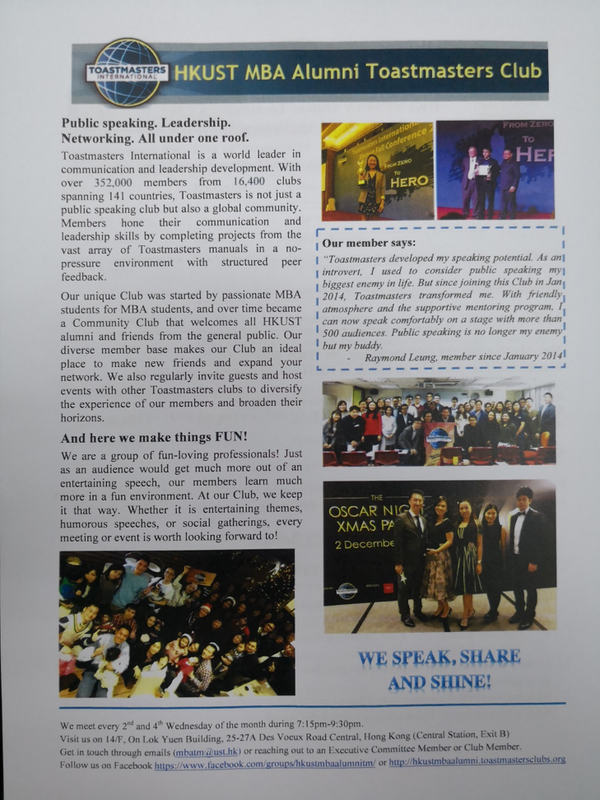 Toastmasters provides an education platform for developing communication and leadership skills in a supportive peer environment. Members can take part in delivering prepared or impromptu speeches, while also working behind the scenes in planning, organization, team building, and time management. The meeting started with an introduction of Toastmasters to the visitors. Members would be able to select a Pathway, which provided a series of projects and activities catered towards a specific goal. Goals to select from include Leadership Development, Persuasive Influence, Strategic Relationships, and Visionary Communication. 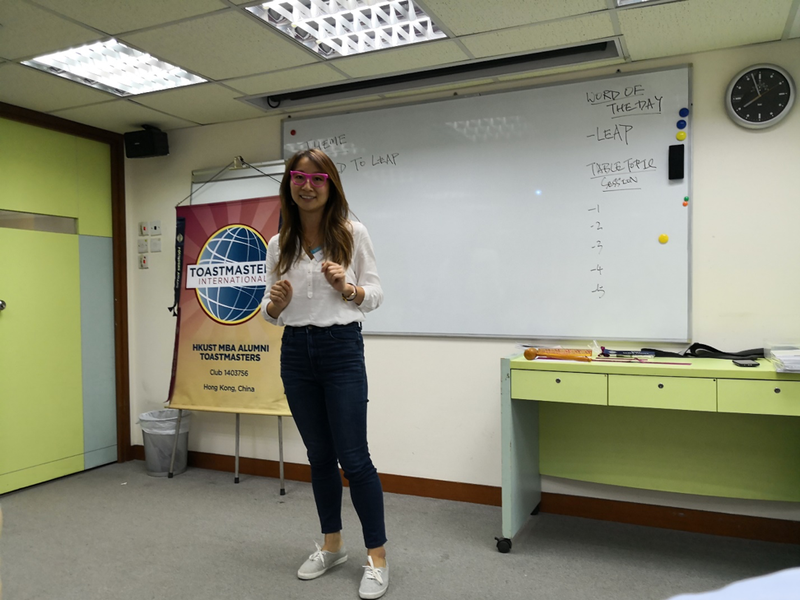 A member of the HKUST MBA Alumni Toastmasters Club, Sim, gave a prepared speech on the use of body language as part of her Pathway on Dynamic Leadership. She even whipped out a giant pair of purple glasses as a prop to keep the audience engaged! Table Topics, or impromptu speeches, were a way to talk “off the cuff” about a random topic with no time for preparation. Students from both the MBA Full-Time and MBA for Professionals joined to try their hand at this, with Alex, Amit, and Janson taking part. Our very own Alex took home the Best Table Topics Speaker Award, as voted for by the audience. It turns out that even impromptu speaking can be improved with practice! Feedback was provided to all the speakers by evaluators, highlighting strengths that made the speeches memorable as well as providing suggestions for making the speeches even better. The Time Keeper, Grammarian, and Ah Counter provided reports recognizing speakers who made good use of time, used creative language, and minimized making unnecessary sounds. It was a great learning experience for all, providing an excellent platform and learning opportunity for people to practice speaking in public. Group photo with all the participants, members, and guests. Club member Sim giving an impassioned talk on body language as part of the speech. Love those glasses!